Franz Josef Pschierer (centre), the Bavarian State Minister for Economic Affairs, Energy and Technology, visited DLR’s exhibition at ‘automatica 2018’ on 19 June 2018. He was particularly interested in the interdisciplinary DLR project ‘Factory of the Future’. SARA (Safe Autonomous Robotic Assistant) is the new generation of lightweight robots developed at the DLR Institute of Robotics and Mechatronics. With SARA, human-machine cooperation is gaining in intelligence, security and efficiency, allowing new application scenarios in Industry 4.0. 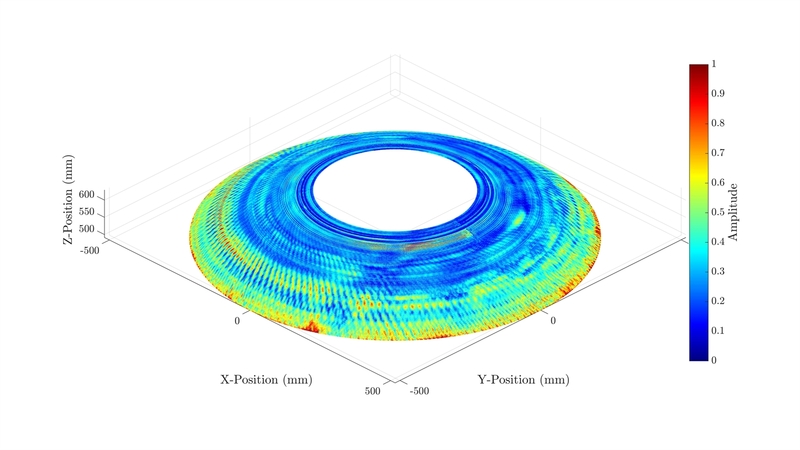 Ultrasound image acquired during the robot-assisted examination of the dome area of a CFRP solid propellant booster casing at ZLP Augsburg. The System Control and Innovation Lab (SCIL) is an open innovation laboratory at the DLR Institute of System Dynamics and Control devoted to ‘digital twin’ and virtual product development. Small- and medium-sized enterprises gain access to technologies and expertise in digital engineering in order to gain a competitive advantage. The MIRO Innovation Lab (MIL) is an open innovation lab addressing the field of robotic medicine; it is funded by the Helmholtz Association of German Research Centres. 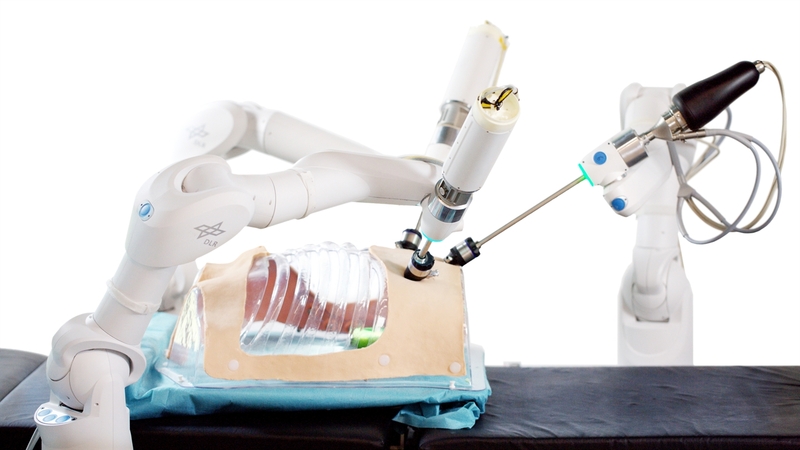 This image shows the DLR robotic system MIRO, which is designed for surgical applications. 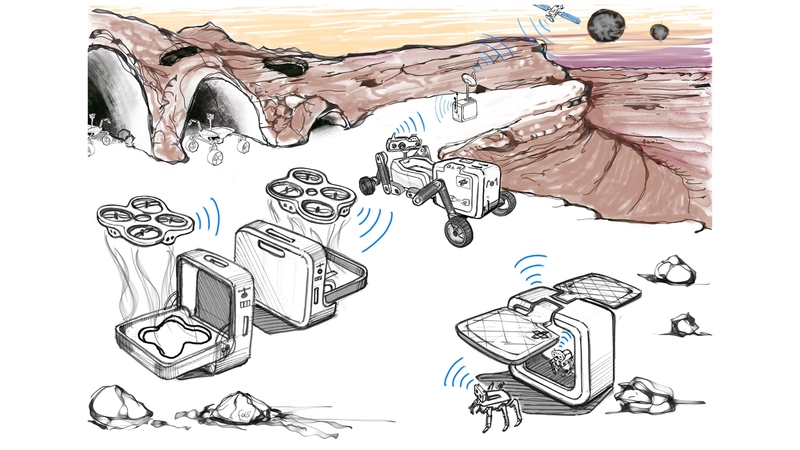 Heterogeneous robot teams can tackle tasks together; for example, the exploration of inaccessible environments and alien planets. The robots serve as the ‘extended arms’ and ‘extended eyes’ of humans. 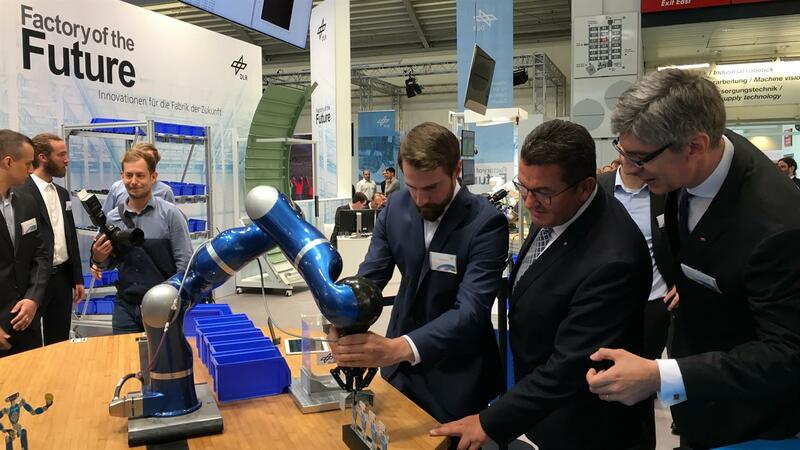 From 19 June 2018, the German Aerospace Center (Deutsches Zentrum für Luft- und Raumfahrt; DLR) is presenting current highlights from the field of automation and robotics at 'automatica 2018'. The focus is on the 'Factory of the Future', with research work and projects for intelligent, autonomous and collaborative production using lightweight robots. This combines the latest digital technologies with the traditional strengths of automation, mechanical engineering, electrical engineering, and materials and process engineering. This includes 'cobots', which are as easy to program as smartphones, and intelligent assembly robots that create their own programs. The DLR Institute of Robotics and Mechatronics is also presenting the Safe Autonomous Robotic Assistant (SARA), the next generation of lightweight robots – intelligent, connected and flexible. "German and European industry recognise digitalisation as a major challenge. The interdisciplinary 'Factory of the Future' project allows DLR's robotics research to make a special contribution to implementing this transformation in Germany, thereby increasing its global competitiveness," says Alin Albu-Schäffer, Head of the DLR Institute of Robotics and Mechatronics and Coordinator of the 'Factory of the Future' project. In the spacious, interactive demonstration area, DLR will present key aspects of robotics in the networked production systems of the future. SARA is the next generation of DLR’s lightweight robots. Its robotic arm features new mechatronic functionalities and intuitive programming. While the operator prepares to perform a task, such as an assembly process, SARA simultaneously records the corresponding position and force trajectories; that is, the DLR robot not only learns what to do, but also how to do it. The 12-kilogram arm is extremely sensitive and can easily be guided through its large work area. On command, the robot carries out its tasks swiftly and accurately; for quality assurance, the force curves can be monitored with a bandwidth of eight kilohertz. SARA, the new DLR lightweight robot, makes cooperation between man and machine more intelligent, safe and efficient, thereby allowing new application scenarios in Industry 4.0. Collaboration between humans and robots also focuses on the development of an intelligent robot assistant with intuitive programming and multimodal input options. Humans and robots jointly, safely and efficiently program complex assembly tasks and cooperate during their execution. 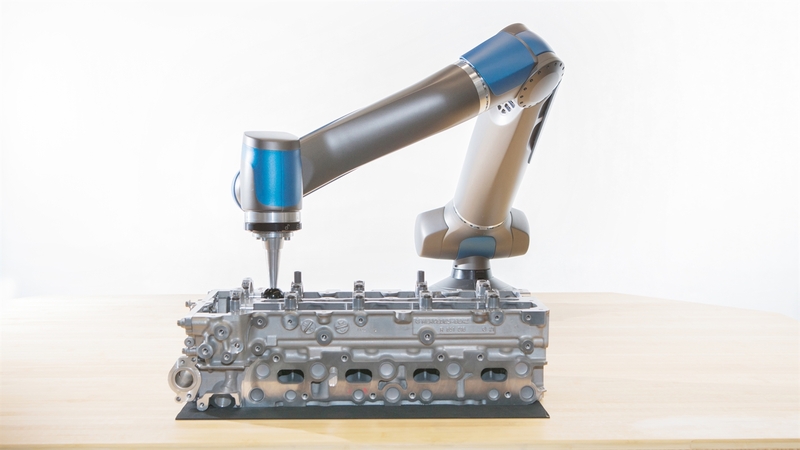 Unique, innovative software enables the robot to automatically and intelligently program itself. Advanced, intelligent planning and implementation algorithms allow rapid configuration for production with small batch sizes. Robotic systems can assemble individual products at the touch of a button without any additional manual adjustments. Even complex assembly tasks can be reliably performed by the autonomous assembly system. Mobile autonomous robot systems significantly improve production flexibility. The autonomy of the mobile systems enables the robust, effective and spatially independent implementation of all tasks, even under highly variable working conditions. The DLR Center for Lightweight-Production-Technology (Zentrum für Leichtbauproduktionstechnologie; ZLP) in Augsburg is developing an innovative robot-assisted process for production-integrated quality assurance. With the help of 'adaptive air-coupled ultrasonic testing', large carbon fibre reinforced polymer (CFRP) structures, such as aircraft components, can be accurately and efficiently inspected for faults. The test robot’s ultrasound transducers automatically adapt to the component's properties and deliver high-quality 3D ultrasound images. A lightweight robot is used for this, integrated into the control system of an industrial robot. As part of the EU SoMa (Soft-bodied intelligence for manipulation) project, DLR will demonstrate what the future may look like for an online supermarket. The exhibit is fitted with a lightweight robotic arm and flexible low-cost gripper, the DLR CLASH Hand. This allows the robot to reliably pick and package fruit, vegetables and other items of varying shape, size, hardness and weight. The process is completely automatic. Autonomous, networked robotic systems are also becoming increasingly important for science. DLR is presenting the Autonomous Robotic Networks to Help Modern Societies (ARCHES) consortium at the exhibition. Key robotic technologies, as used in space exploration, for example, are being researched across domains and disciplines to create a basis for addressing societal challenges. As such, it will be possible to develop applications in disaster management, medicine and therapy, logistics and autonomous urban traffic in future. The SMiLE (service robotics for people living with reduced mobility) project shows how robotics can provide direct assistance in everyday life. SMiLE robots are designed to empower people to live fuller and more independent lives, despite having mobility restrictions resulting from illness or age. In collaboration with Caritas, for example, the wheelchair assistant EDAN (electromyography-controlled daily assistant) is being tested, which can also be remotely controlled by muscle signals or other intuitive input devices. These include tablets and haptic input stations. This also applies to humanoid robots such as DLR's Justin, which are intended to be used as home assistants. The 'MIRO Innovation Lab' (MIL) works in the field of medical robotics, developing new applications. The MIL combines the technological knowledge of the DLR Institute of Robotics and Mechatronics with the expertise of clinical partners, industrial companies and other research institutes – from the initiation of early innovations to the development of prototypes. 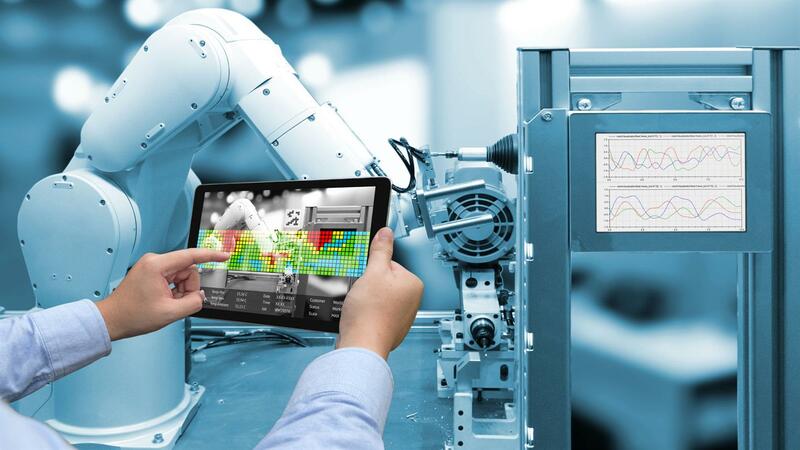 The DLR Institute of System Dynamics and Control's 'System Control and Innovation Lab' (SCIL) is another interface between research and industry, focusing on digital twinning and virtual product development. In this innovation laboratory, SMEs in particular gain access to the latest design technologies and software tools for modelling, controlling and regulating complex mechatronic systems, covering the entire range of technical applications. In SCIL projects, SMEs can sustainably develop expertise in digital engineering, thereby securing a competitive advantage. DLR is represented in Hall B4 / Stand 501 502 at the trade fair, with a total of 12 exhibits. As well as the DLR Institute of Robotics and Mechatronics and DLR Institute of System Dynamics and Control, which together form the Robotics and Mechatronics Centre (RMC) in Oberpfaffenhofen, the DLR Center for Lightweight-Production-Technology (ZLP) in Augsburg and DLR Technology Marketing are also involved, along with 10 RMC spin-offs. 'automatica 2018' is taking place from 19 to 22 June at the Messe München trade fair centre.